Along with a lot of fans of the original G1 cartoon series (and a lot of fans of good movies, apparently), I have a strong dislike for the Michael Bay for the live action films. In fact, I wrote an entire article based on why we hate them! But some good did come out from these awful films and that would be the toylines! The toys, for the most part, are bundles of great engineering, with all of the little parts moving and connecting together with genius precision. When it was announced Transformers: Age of Extinction would include the Dinobots, I was stoked! As a kid, I loved all of the Dinobots; I mean, what kids wouldn’t love them? They mixed together two things that young boys loved: dinosaurs and robots! So having robots that actually transform into dinosaurs is a no-brainer! This was one of the reasons why I was so excited to get the Leader Class Grimlock action figure based on the film’s version of the character. Although I was let down by the figure in the end, I still contend it was worth getting. After playing with Grimlock for a couple of days, I think it felt… lonely. Grimlock needed to get his Dinobot brothers (well, the ones currently available now, that is). 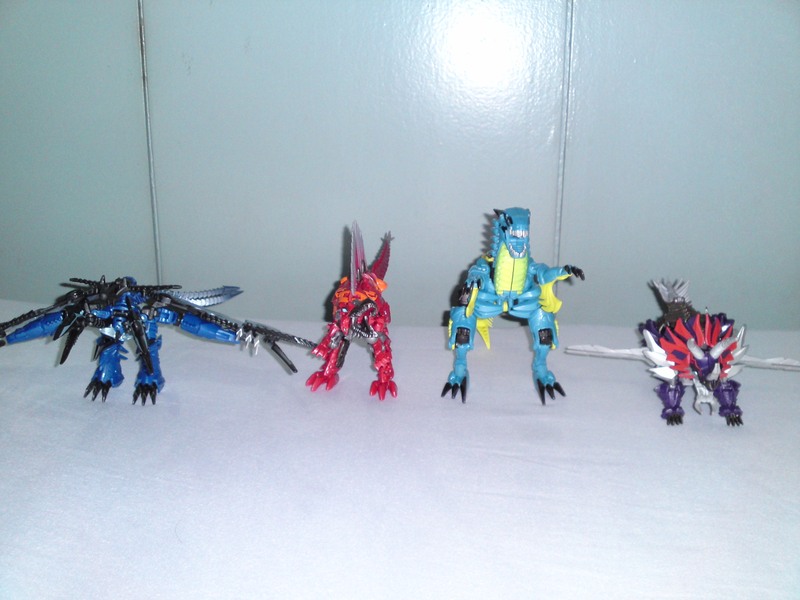 So, the next day, I went to the closest Toy Kingdom and got Slug, Strafe, Slash and Scorn! Sure they cost a pretty penny to get all four of them. But, hey, that’s why I get paid for working at my job, right? I’d have to say Slug is the weakest among the four Deluxe class toys. So Slug is the one that transforms into the triceratops making him Slag’s G1 incarnation in the film. In Europe, the triceratops is also called Slug (because Slag is a derogatory term over there) but I still remember his as the tough Dinobot that loves to fight the most among the rest of them. In dinosaur mode, he feels like a solid block. You can move his legs and jaw somewhat but that’s it! It’s like you’re playing with a beautifully sculpted paperweight! It would’ve been great if gave his dinosaur head some range of motion so his triceratops mode could be configured into more dynamic poses. Also, the placement of his swords in this form is weird: they just jut out from his sides! It looks ugly! 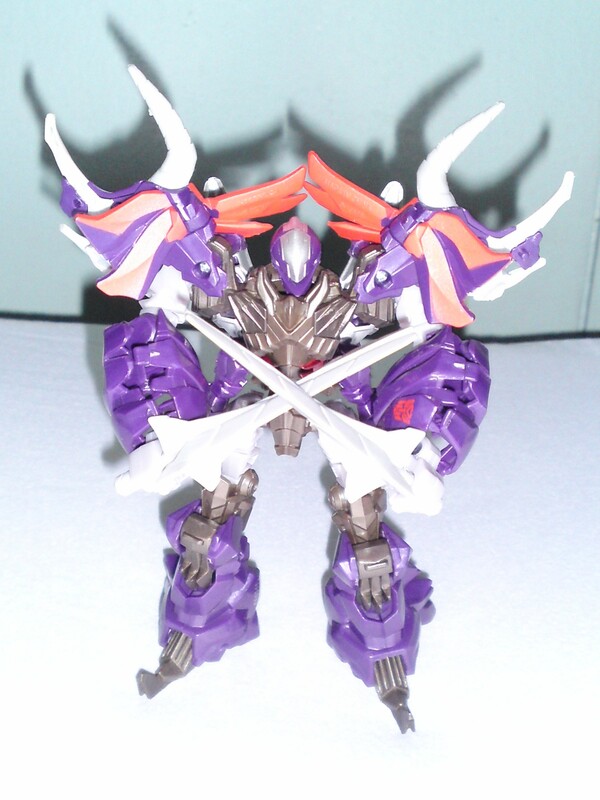 I wish they found a more creative way, like maybe making his transform into his horns in dinosaur mode. I’ll slice your calves with my awkwardly placed swords! In robot mode, his Popeye-like body proportions don’t help him. His forearms and lower legs are fat but his chest and torso areas are extremely skinny, making him look like a bodybuilder that didn’t know what he was doing. 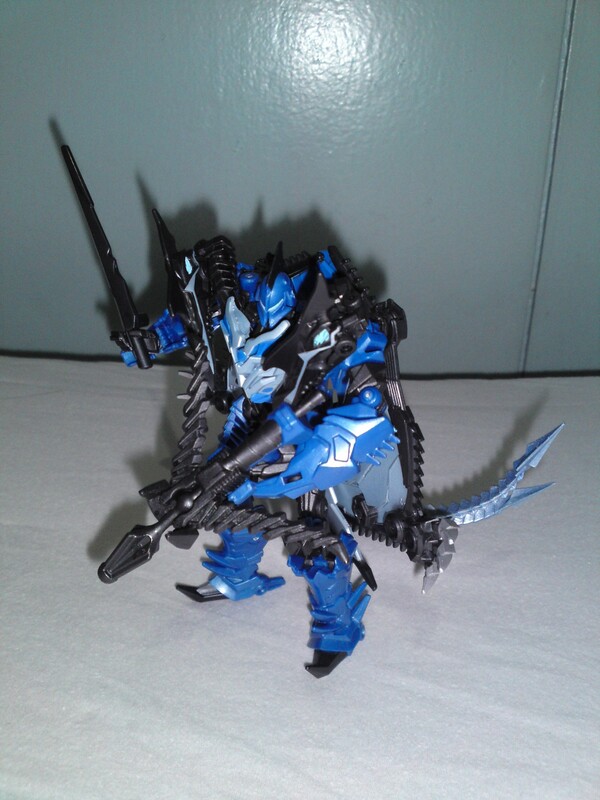 Also, since the dinosaur head transforms into his shoulder armor, it makes his head look small. Speaking of his head sculpt, it’s pretty bland as it’s just one big aerodynamic glass helmet. I wish they put more work into it. However, in robot mode, Slug does have a lot of articulation points, making it easy to pose him into energetic looking poses. 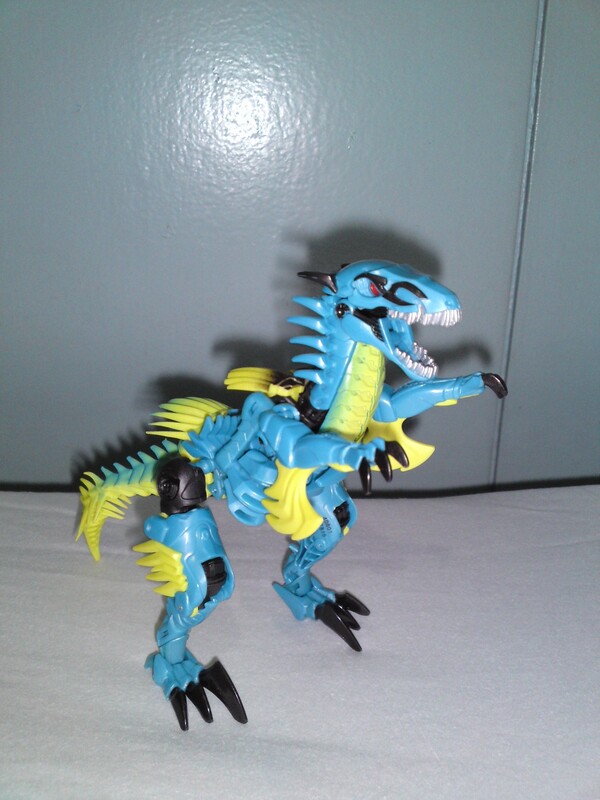 Strafe is a blue pteranadon and is the modern version of Swoop from the G1 cartoon. 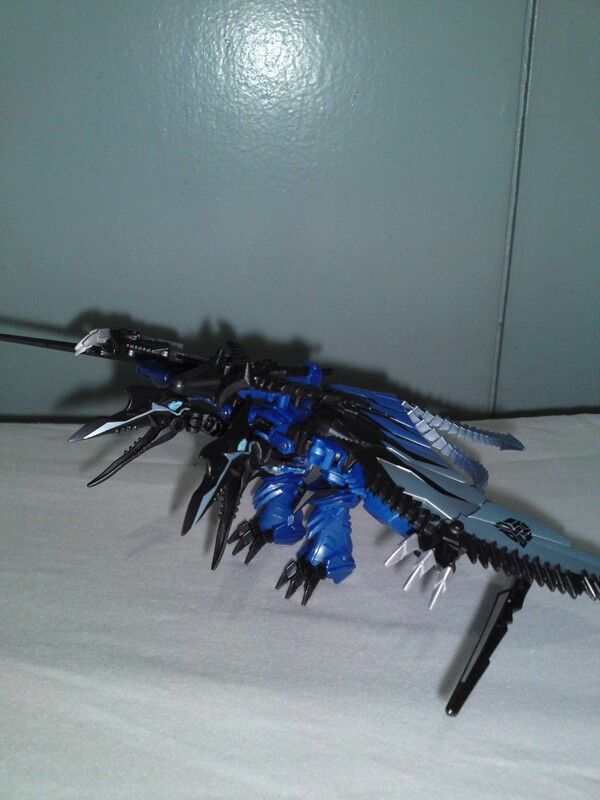 For some odd reason, they made Strafe’s dinosaur mode into a two-headed pteranadon. I understand having a two-headed dinosaur of anything sounds good on paper. But doing this was totally unnecessary! This really hurts his overall look in his alternate mode. But, frankly, that’s Strafe’s only weakness in dinosaur mode. He’s got an impressive wingspan and you can actually bend his legs forward enough so you can get him into a perching position. Did I mention he’s got two heads? He does have a few more issues when in robot mode. The two pteranadon heads are blatantly obvious as they’re placed on the chest area and they don’t really peg into any area to keep them from drooping downward. His legs kind of bend outwards but, unless you really look at it, you won’t notice. My biggest issue with his robot mode are his arms: his hand are configured so that his palms will only face upwards when you bend the arms at the elbow. This wouldn’t be a problem if Strafe had some wrist articulation but it wasn’t engineered into the figure. Sad really. Strafe’s robot mode looks really great but his “gorilla arms” really limits his poseability. Had to wrack my brain to find a good looking pose to hide the problem with the arms. 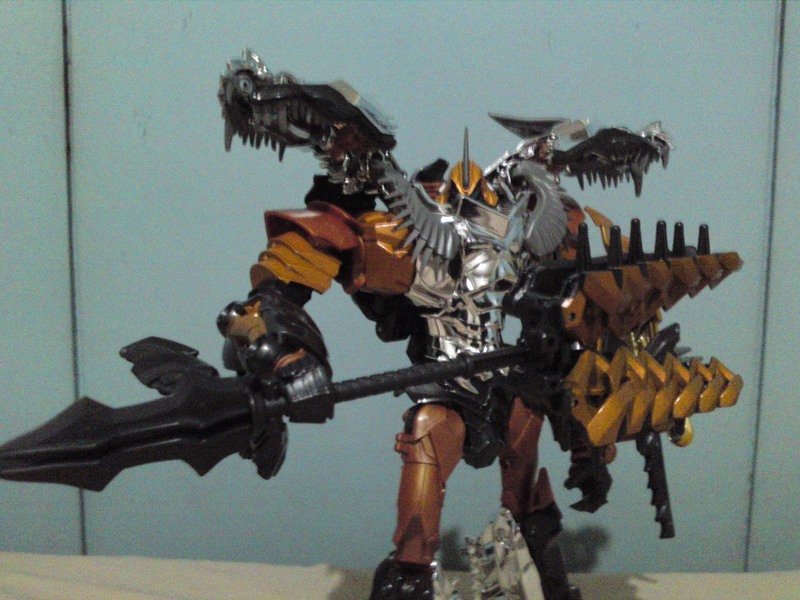 Slash is a new Dinobot and doesn’t have a version from the G1 cartoon. He transforms into a sky blue velociraptor. I have to say, in raptor mode, Slash really looks fantastic! In his alternate mode, Slash really looks like a fearsome creature! There are a lot of nice details that really pop out in this mode. The only weakness I can see in his alternate mode would be the lack of an elbow joint in his arms. The color might also seem a little weird and kind of wimpy but it does make Slash look like a sleek and fast dinosaur. It’s easy to get him to stand even with his scrawny legs. I also like the design of his robot mode. It looks like they put a lot of effort into engineering his transformation. Besides the dinosaur arms, they did a pretty good job in disguising the little dinosaur bits and pieces while in robot mode. His double axes are made of a soft rubber and become the “feathers” while in Slash’s alternate mode, which is the reason why you can’t bend his dinosaur arms. But I would’ve sacrificed that if they got him to bend them. I didn’t like the “feathers” on his legs with Slash is in his robot mode. It looks like he’s wearing an inverted grass skirt. 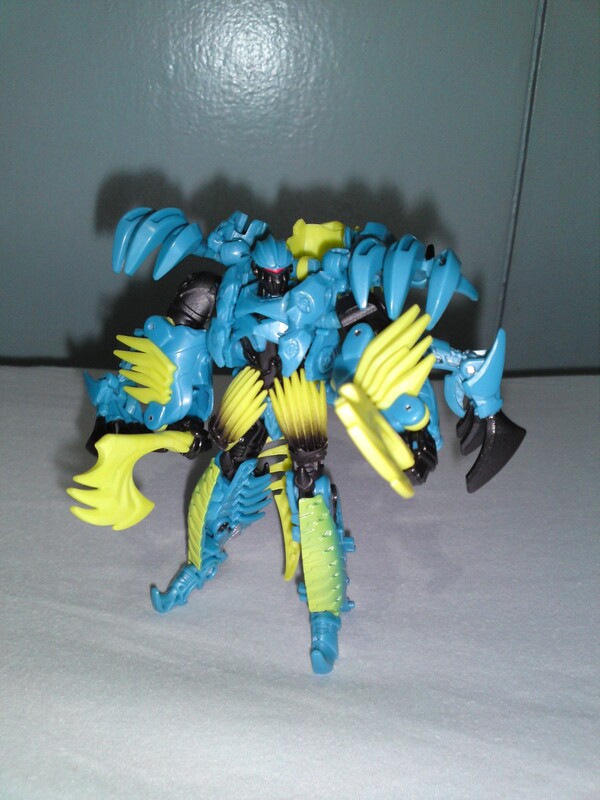 Also, like Strafe, he’s got gorilla arms, which also hurts Slash’s poseability immensely. 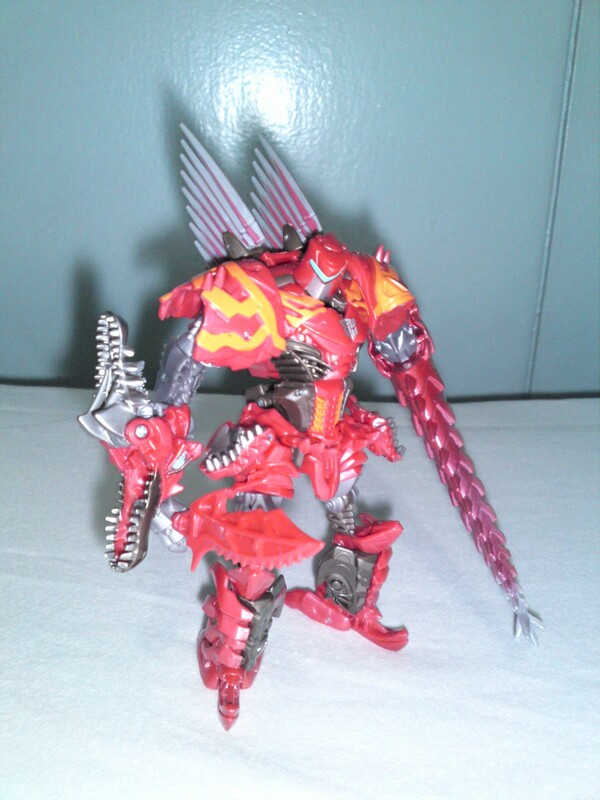 Among the four Deluxe Dinobots, Scorn is my favorite. 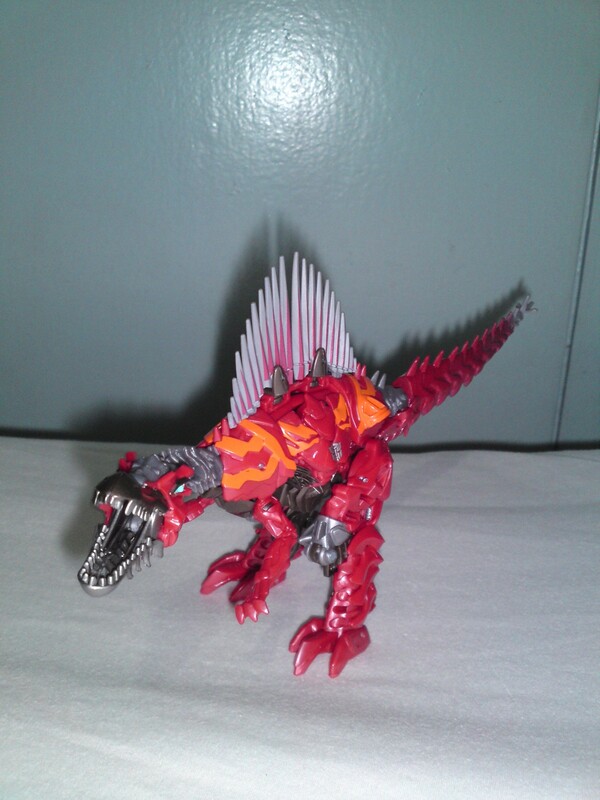 He’s a red spinosaurus so he doesn’t have a G1 counterpart. 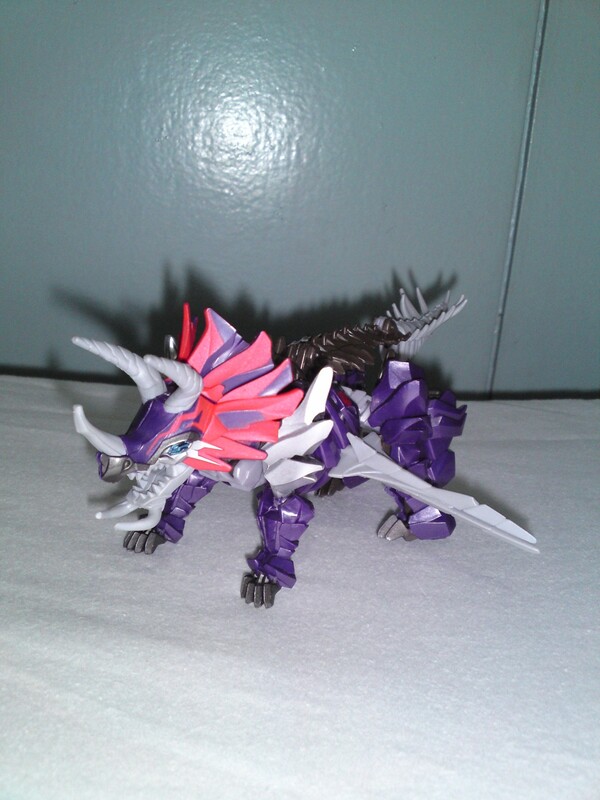 But that’s okay because both his dinosaur and robot modes are just so damn cool looking! The colors really pop out, especially when in his dinosaur form, making it really easy to see all of the nice tiny details they put into the overall design. I like that, not only can you move his neck up and down, but you can also move his head from side to side! Scorn’s spinosaurus form’s only weakness is the position of its legs. Since they’re off-center, you’ll need to make a lot of adjustments to get him to stand without falling over at the slightest touch. Took me a total of 8 minutes to get it to stand! No fooling! His robot mode also looks great. I love the way the fins transform into this weird protrusions on his back; makes Scorn look more dangerous. I like the huge shoulder pad as well as it makes him look like a bruiser! I didn’t expect to like his arms, especially since the head and tail transforms into his right hand and left arm, respectively. I do wish the tail was just something you can detach, revealing a real hand underneath but him having this “lance” permanently connected to his arm actually looks good. I do wish they found a better way to transform his right arm, though. No matter what you do, it still looks like a giant dinosaur head. Still, Scorn’s robot mode has got a lot of articulation and is probably the most fun to pose. See? The colors still pop out in robot mode! If you look at all of them, you’ll notice that all of the Dinobots have a medieval look going for them. Giving them a singular theme was really a great idea since it makes them look like a team. It also compliments their features as well. Unfortunately, the Deluxe figures don’t scale well with Leader Class Grimlock. They’re just too small in comparison with the huge figure. This is especially evident if you look at them in their robot modes. Grimlock towers over them like a giant, making the Deluxe figures look like wholesome dwarves. I’m considering getting the Voyager Class Grimlock since he may work better with the rest of the team, size-wise. The Deluxe Dinobot figures really look well together as a team. Even Slug, who is dull by himself, looks really great when he’s with the rest of his Dinobot brothers. 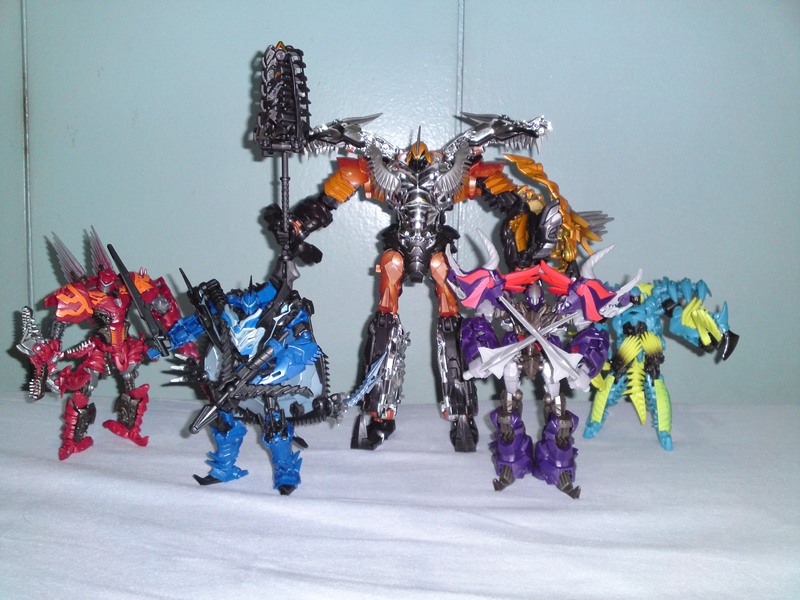 I don’t advise that you get only 1 or 2 of the Dinobots; I suggest you get all four of them if you can. However, if you can only get a couple, I’d say get either Scorn or Slash and avoid Slug at all costs. But, like I said, you can’t go wrong if you get them all. What do you think of the Dinobots toys? Are they worth getting? Whatever your thoughts, leave them in the comments section below!